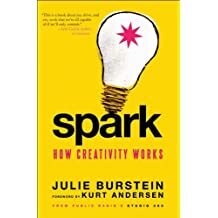 This month, I’m sharing a few of my favorite observations from Spark: How Creativity Works by Julie Burstein (Harper Collins, 2011), based on interviews conducted for Public Radio’s Studio 360, by Kurt Andersen and produced by Burstein. So I’m starting something new here. 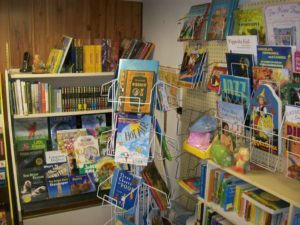 Every so often – how often, I don’t know – I’m going to shine a little spotlight on an indie bookseller I’ve met and particularly enjoy. First up: Debbie Lame Sporich, owner of The Bookstore in Dillon, Montana. 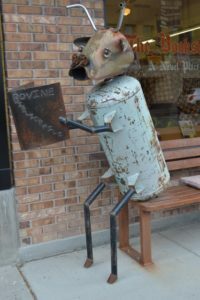 How can you not adore a bookstore with a Bovine Bibliophile welded from cast-off metal outside? (Piscture below.) Inside are new books, used books, cards, art supplies, and a big, beautiful woman with a fabulous smile and infectious laugh. 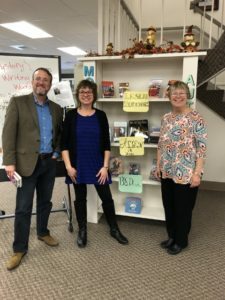 We met when The Bookstore and the Dillon Public Library, an original Carnegie, co-sponsored a writing workshop last fall and invited me to teach, along with Barb BJ Daniels and Allen Morris Jones. (That’s us below, me in the middle and Barb on the right, in front of a display of our books in the UM-Western Library.) We had a blast. Read on – I think you’ll be as charmed as I. About Debbie, in her own words: A lover of words, a student of life, a collector of dictionaries, the wife of Bill, I love to laugh and I take a book to the movie theater. I ride a pink Honda Scooter. A sometime artist who plays with watercolor and creates personal meditation boxes. Lives with a goldendoodle named Tonka. Eldest of 4 sisters, born and bred Montanan, raised in Augusta on a ranch. After college at UM, moved to Dillon, an area full of history and local authors. I love to help others find that perfect book. I wake each day (grumpy) but eventually find my groove and I love what I do. Life just doesn’t get any better than this. I finish about 5 books a week – I may wake up grumpy because I stay up too late reading! I’m working on a review of March by Geraldine Brooks for the local Shakespeare Book Club, which has been active for over 120 years. Also reading right: Atomic City Girls by Janet Beard, Less than a Treason by Dana Stabenow, Churchill: Walking with Destiny, by Anthony Roberts, Sound of Gravel by Ruth Wariner, Endless Beach by Jenny Colgan, The Work is Murder by Anthony Horowitz, and 1000 Books to Read Before You Die – I am making lists! 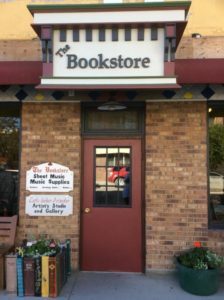 Tell us about The Bookstore: Established in 1984; I bought it in 1992, knowing nothing about running a business – I just knew that I loved reading and books. 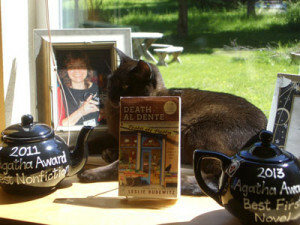 We are an independent bookstore with a little bit of everything, and a great collection of local and regional authors. I love working with kids of all ages and I get excited when they discover an author who speaks to them. What do you love most about being a bookseller? Almost everything. What I get to do that online stores don’t is be involved with my customers. I get to pick out books for baby showers, help the harried parent find something new to read because if they have to read (fill in the blank) one more time they may lose their mind — I get to hold that child on my lap and read to them during story time, I get to help them spend that money from Grandma on a new book, I get to celebrate that move from easy reader to chapter book and I get to talk to them about all the books along the way. I am now seeing children of kids who hung out here when they were kids. I get to see the look in their eyes when they find that book. I still get goosebumps when I walk through the door, every day. I love that I get to be surrounded by books all day and talk to people who love books all day. I am better at reading books than doing books, so I have an accountant! What’s flying off your shelves this winter? Becoming by Michelle Obama, The Tattooist of Auschwitz, Beneath a Scarlet Sky, Royal Wulff Murders, The Meateater Cookbook, Educated, and anything by Mary Oliver. I can’t wait to get my hands on a copy of Maid, by Stephanie Lund of Missoula. Plus, how can you not adore a bookstore with a Bovine Bibliophile out front? I’m continuing to share a few of my favorite observations from Spark: How Creativity Works by Julie Burstein (Harper Collins, 2011), based on interviews conducted for Public Radio’s Studio 360, by Kurt Andersen and produced by Burstein.